Men can do vintage too! It’s not easy to find good quality vintage-style clothes and footwear if you’re a man, as the vintage trend seems to cater more to the girls. The balance has been redressed in style with the fabulous Revival Retro, a boutique on ultra-fashionable Carnaby Street with a dedication to making men look just as sharp as their female counterparts in vintage-styled outfits that will make any man about town stand out in a sea of unoriginality and chain store sameness. You might pay a bit more for it than you would M&S but this stuff is built to last. So cool, so cute. 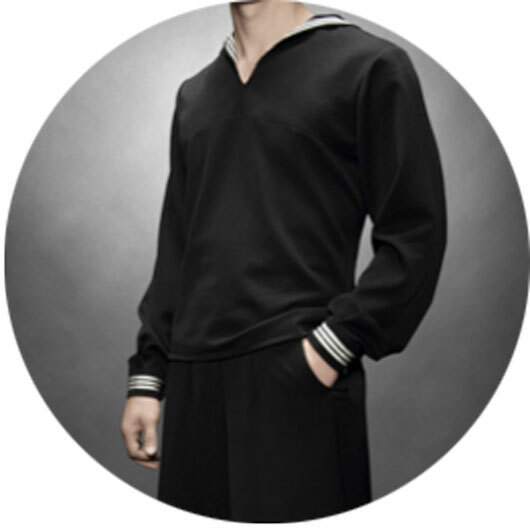 This is a handsome sailor suit with a hand embroidered authentic collar and a waisted cut which gives a flattering less bulky appearance. This vintage style men’s sailor top looks much like those featured in the ‘Shanghai Lil’ scene in the 1933 movie ‘Footlight Parade’. Dress sharp and play it cool in this Cincinnati Kid two-piece suit. 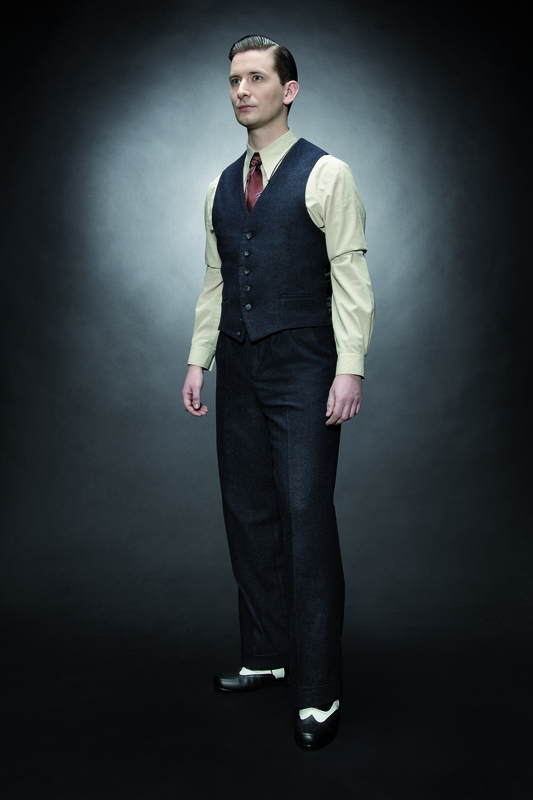 The sophisticated blue tweed college vest features shoulder yokes and two welt pockets with a seven-button facing. The high quality blend wool and a delicate taffeta lining provide for a distinctive look and perfect comfort. The figure hugging cut is great for an optimal fitting and enough room to knock out an ace out your sleeve. The matching blue tweed pants have extra-wide legs, turn-ups and taffeta interior lining. The high waistband with four wide belt loops and two buttons provides for a classic look, and two sideward transverse pockets and one welt pocket at the back give you just enough room to stash your cash. This vintage waistcoat has been reproduced in an authentic style with a classic waisted cut, two welt pockets and shoulder yokes in the same almond brown fabric. 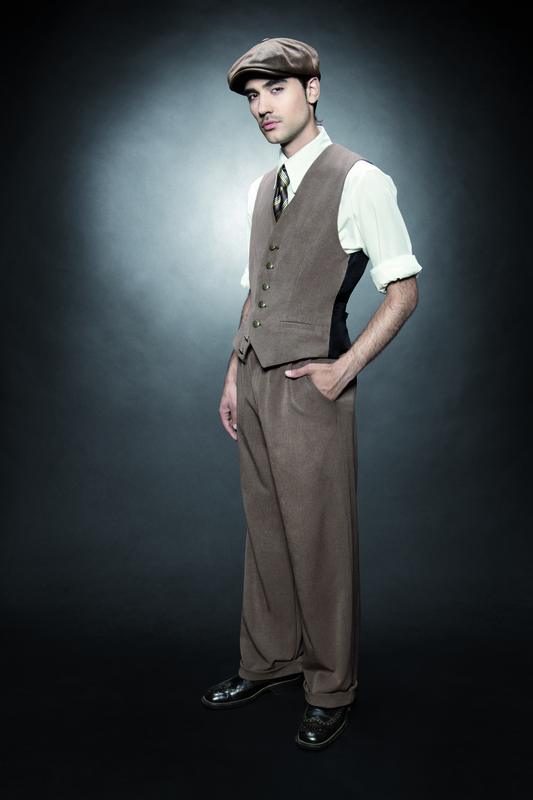 An elegant 1940s style men’s trouser. This trouser features pleats, extra wide leg, turn ups and a high waistband with four wide belt loops. Wingtips were considered very stylish in the thirties and forties and have seen a revival in recent years. 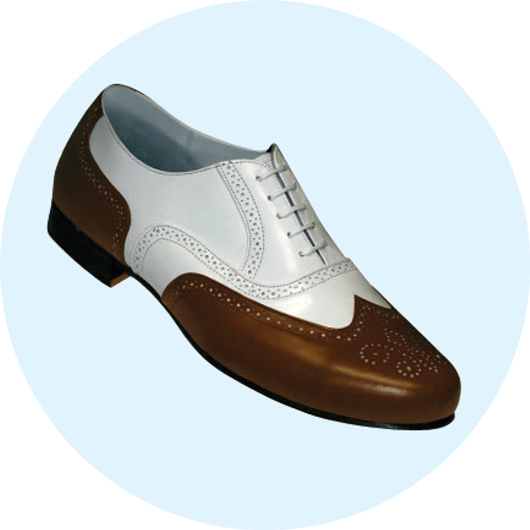 The ‘spat style’ variant of the Wingtip Spectator shoe is a white and brown two tone. This entry was posted on June 7, 2012 by inspiredessex in Gentlemen's Den and tagged essex fashion, gentlemans fashion, revival retro, vintage menswear chelmsford.